Outside his arctic Fortress of Solitude, Superman screams so loudly that it shatters windows all the way in Metropolis. At S.T.A.R. Labs Lex Luthor laments the death of Lois Lane while Batman considers that Superman is out of control and not holding back his strength. Soon they take off in Lex's jet to fly north and help Superman. Flashback to a few hours ago after Superman's heat vision went out of control thanks to Brainiac's exobyte. The beams hit Lois at full force so Superman knelt holding Lois's lifeless body in his arms while Luthor called him a murderer. But Superman turned on Lex knowing that he was involved with Brainiac from the beginning and is partly to blame for this. Since Brainiac was still out in space somewhere, Luthor was a much closer target for his rage. He picked Lex up by his throat and almost snapped his neck, but Wonder Woman and Batman convinced him to let go. Realizing the line he had nearly crossed, Superman flew off. And that brings us up to speed. Still on the jet, Luthor realizes what no one else could, that Brainiac had specifically orchestrated Lois's death from the beginning, even though Lex had specified that she was to be left alone. He had also attacked Metropolis against Luthor's demands by bottling the Daily Planet building. He must have linked the exobytes in Lois's body to react while in proximity to Superman, thus guaranteeing she would be the target and that this would break the Man of Steel's psyche. The secondary exobyte effect was causing Superman to go insane, which the death of Lois would simple exacerbate. Batman explains that Brainiac is most certainly a living entity despite being a machine. Luthor agrees, and no one refutes their claims. They land and park the jet, then take off on Lex's "hoverforms," which are flying platforms to help those who can't fly complete their journey to the Fortress. There's a drawn out discussion of Brainiac's technology versus that of Earth, including S.T.A.R. Labs and Luthor himself. So Luthor can only tell that Superman's signal stopped while he was in the Fortress, but not that he had gone into space to confront Brainiac. Meanwhile in space, Superman's attack is stopped when Brainiac boasts about how easy it was to make him kill his wife. Thanks to some Kryptonite, Superman is incapacitated and dissection begins. After the initial cut into Superman's chest, Brainiac changes his mind and decides that if he can recreate Superman's powers and put them into drones that he controlled, it would make conquering the Universe a lot easier. Superman yells, "NEVER!!" and breaks free. He attacks Brainiac boasting that even though he doesn't normally kill, now he really wants to. Just as Lex and the other heroes arrive on the ship, Superman tears Brainiac in half. While the others are shocked, Superman coldly states that, "There's nothing left to say except goodbye." He takes off into space and Wonder Woman decides to let him go without chase. After a moment, Luthor discovers that what Superman "killed" was only a robot clone of Brainiac and not the real thing. Firestorm wonders if Superman already knew that when he killed it, but Batman suspects that it probably wouldn't have changed anything anyway. 24 hours later, Lex Luthor has funded a tasteful funeral for Lois Lane. He claims to have been in love with her and didn't deserve this. He vows never to disappoint Lois's sensibilities or her memory ever again and that he will take the fight to Brainiac and save the Universe for her. Story - 3: I mentioned a prediction a while back that Superman would inadvertently cause the death of Lois. I first assumed that she would die all the way back when I first saw the opening video/trailer to the DC Universe Online game where Superman had appeared to have exiled himself in space close to the Sun. Part way into the series I was fairly certain she would die at Superman's hand, possibly due to Brainiac's control (although I didn't rule Luthor out in the beginning). What I hadn't considered was that Brainiac linked the exobytes used to give Lois her powers so that it would activate Superman's exobyte when they got near each other. On one hand, that isn't what appeared to happen at the end of the previous issue, but there's no telling for sure. I wasn't sure that the reason for the Daily Planet building's heist would ever be fully explained except to say that it gave people super powers that would turn them into heroes and villains in this story the same way it did in the game. With the death of Lois, we can now be 100% positive that this is not the same universe that the game is played in. For one thing, in the game Superman is sane and Lois is still around. Since I've had some questions to this affect, I will clarify that this continuity leads directly to the future seen in the game trailer and continued in the first several issues of this series. When future Lex Luthor came back in time to change the past, it had to have been before this moment, so it created an alternate reality in which the game is played. It would be pretty neat if a later upgrade of the game allowed players to enter this story's timeline and play it out, but I assume the comic will remain its own thing. There's a very odd discussion of Brainiac in this book that I'm not sure I can agree or disagree with, but it's odd that all of the heroes simply accept it as fact because Batman and Lex Luthor agree about it. Obviously Brainiac (in this story and many other current ones) is a machine, but he's so advanced that he has specific desires like the bottling of cities from various planets and the need to oversee the destructions of the worlds he conquers. Batman and Lex agree that he's technically alive because of those desires. But I've always gone off the version from "Superman: The Animated Series" that spawned this version to begin with, that he (or it) is simply working off his original programming to persevere data about organic life on Krypton and then the rest of the Universe. On the other hand, Brainiac's specific hatred of Superman reinforces their opinions (or facts as far as they're concerned) that Brainiac, as a sentient artificial being, is alive. My problem is that it's a hard sell to begin with and there just isn't enough time for several of our other opinionated heroes in the room to refute those "facts." Instead their opinions are just accepted as rote. Ultimately it becomes the reason why Superman shouldn't "kill" a seemingly sentient machine because of his strong stance against killing. 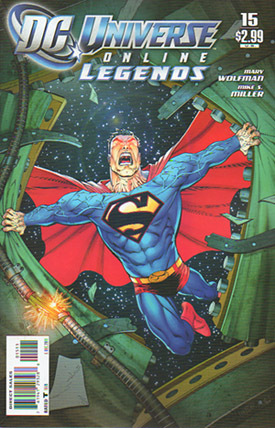 At least when the Brainiac clone Superman killed turned out to be fake, they questioned if Superman knew it or not. It's an interesting idea, but based on a flawed premise. Art - 5: The more I look at Mike S. Miller's work, the more I enjoy it. In my experience as a reader, taking the time to draw many characters in a Justice League kind of story is difficult enough, but doing it well not only takes a lot of work, it puts the artist into a new level of scrutiny for all the fans of all the individual characters. So Miller could draw the most amazing Superman, Batman and Wonder Woman, but if he faltered on Green Lantern, the Hal Jordan fans would let the world know. This gets a five because it has all the detail I expect from a three dollar book in spite of the many characters that color the pages. Sure I could to without all of Superman's veins peaking through his tights when he gets angry, but the effect is still valid and it's just a judgment call on my end. Cover Art - 4: This is almost a great cover. The ripped up hull of the ship from the inside is not only a great idea with a perfect perspective, torn bearings, and sparking electrical cords, but there's one thing that takes away from it. Superman's "S." It's meant to evoke the angry mood that Superman is feeling, but besides the basic light sourcing, which clearly goes against the coloring, there's something far more powerful about the full colored symbol on an angry Superman. The theme of the issue is about a good person being brought to the point of doing something bad, but it would be far more eerie if it was correctly colored.